Here are seven of the best food superstitions I’ve collected over the years. Some may be familiar to you, others not so familiar. But you’d be wise to take note of them all… wouldn’t you? 1. Rice – throw it for prosperity and fertility. Originating in Italy, this is a superstition most people know. It was born in the time when marriage was made to transfer land and power. Throwing rice at newlyweds was thought to be offering wealth and fertility. Why rice? Well, because it was cheaper and less painful than throwing figs. Now, of course, we throw confetti. Not so cheap, and much more difficult to clean away. 2. Pouring two cups of tea from the same pot – bad luck if ever there was. I never heard this from my mum when I was a kid, and she was a stickler about only making tea in a pot; but apparently, if you pour two cups of tea from the same pot, it will bring you bad luck. Of course, nowadays tea is usually made with tea bags. Hard luck if you have a friend who makes two cups of tea from one tea bag. 3. 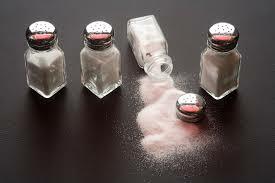 Spilling salt is bad luck. Throwing it is good luck. If you spill salt, prepare to be cast into eternal damnation – or something like that. Fortunately, you can reverse this disastrously bad turn of fortune by simply throwing salt over your shoulder. Your left shoulder. The origins of these two superstitions? The bad luck of spilling salt is supposedly from da Vinci’s ‘The Last Supper’, in which Judas Iscariot knocks over a salt cellar. Not the worst thing he did, to be honest. In truth, both superstitions originate from a time when salt was ridiculously expensive (and even used as a form of currency – try counting out 37 grains from your purse). Spilling salt obviously means money escaping. Throwing salt was only done by those who could afford to throw salt – plus, apparently, you might even hit the devil between the eyes. Assuming the devil sits on your left shoulder, of course. 4. If a man and a woman pour tea together, they will conceive together within a year. Don’t want a child with the man or woman you’re drinking tea with? Then don’t drink tea together! Mind you, I’m convinced this doesn’t work. I watched my grandpa and grandma pour and drink tea together all the while I knew them. Twenty years, between the ages of 65 and 85. They never produced another uncle or auntie for me. 5. Break an egg with two yokes means twins… or death. Hey, if you ever break an egg with two yokes, the closest person to you is going to give birth to twins. A mate’s wife was ecstatic when she was cooking, and this happened. He wasn’t quite so happy – he’d had the snip three years earlier. This superstition originates with the Roma. In Norse culture they have a slightly different take. They believe that cracking a double-yoked egg means death. The choice, I guess, is yours. 6. Bubbles on coffee could mean money coming your way. That end-of-dinner coffee could be the omen you’ve been waiting for. If the bubbles on top float toward you, it means you are about to come into money. That would be the change from your bill! 7. Bubbles in bread… Uh, oh! Oh, my word, this is one you don’t want to happen in company. Especially in a restaurant. If you slice into bread and it contains a large hole, someone at the table is about to die. The hole is a symbol of an open grave. There’s one thing I can say with certainty: don’t leave your choice of restaurant to superstition. Check out what our guests have said about their experience at Christopher’s. No need to rely on luck, place your faith in the judgement of hundreds of others, and discover why we’re rated on TripAdvisor as one of Torrevieja’s best restaurants. For a great evening dinner or Sunday lunch, call Christopher’s on (+34) 600 01 28 24 to reserve your table.